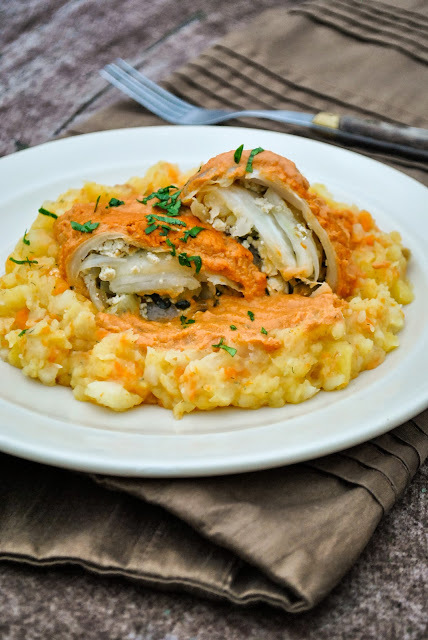 Classic cabbage rolls made of the whole head cabbage are my favorite. But if you have made them before, you know it might take a lot of time. I really wanted to go the easy way this time. I decided to use Chinese cabbage a.k.a Napa cabbage. I had just bought some spinach and tofu, so I had the ingredients for the filling. I also had some tomato juice and sunflower seeds for making the creamy tomato sauce. The cabbage rolls will be a tiny bit crunchy in the end. If you want them completely soft, boil the leaves for a minute or two before filling them. I served these rolls with a root vegetable mash, which was delicious. It was made of potatoes, carrot, turnip and root celery. These cabbage rolls also suit really well with regular boiled potatoes or rice for example. Preheat the oven to 400 F / 200 C. In the meantime, boil the sunflower seeds for 15 minutes. For the filling, heat up some oil in a pan. Add chopped onions and cook for a couple of minutes. Crumble the tofu with your hands and add to the pan. Cook for a minute. Add chopped spinach, salt and ground nutmeg. Stir and cook for a minute. Add finely chopped garlic, stir and remove the heat. Wash the cabbage and separate 10 leaves from it. Beat each cabbage leaf's root with a rolling pin, so it will be more tender and better to roll. Add two tablespoons of filling onto every leaf. 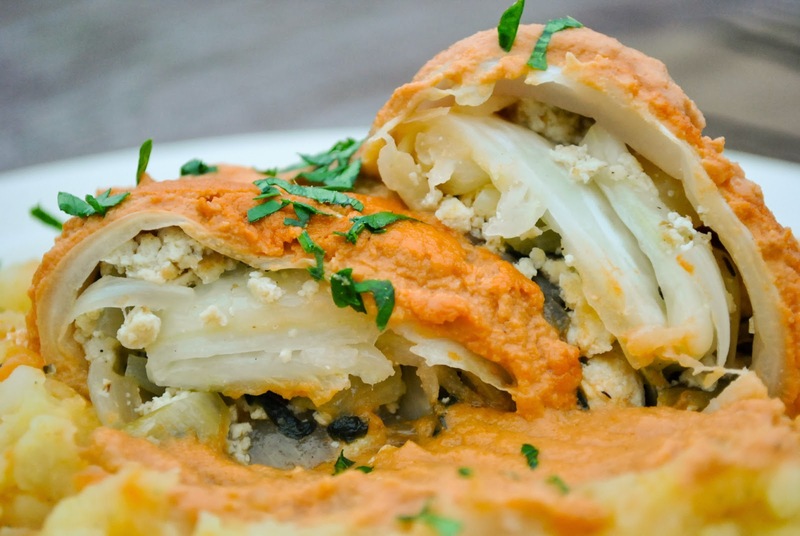 Turn the left and right longer sides onto the filling and then roll it until you have a nice cabbage roll. Don't be afraid to roll them pretty tightly. Put the rolls into a greased medium-sized deeper baking dish. Spread some oil and and a little bit of salt onto each cabbage roll. Bake for 20 minutes at 400 F / 200 C.
In the meantime, you can prepare the sauce. Drain the boiled sunflower seeds and blend them with tomato juice, salt and pepper until smooth. When the cabbage rolls are starting to get golden and crispy, pour the sauce over the rolls and bake for another 10-15 minutes.